A cluster of suicides among the elderly. Such things are not unknown to the police and the deaths are quickly dismissed as routine. Only one man is convinced that something more sinister is taking place. However, no one listens to Tom Thorne anymore. Having stepped out of line once too often, he’s back in uniform and he hates it. Patronised and abused by his new colleagues, Thorne’s suspicions about the suicides are dismissed by the Murder Squad he was once part of and he is forced to investigate alone. I’ve read several Mark Billingham books and feel a real affinity with Tom Thorne, he’s a bit like an old slipper of a detective isn’t he! I never really felt that the TV adaptation reflected the Thorne of the books but maybe that’s just me. 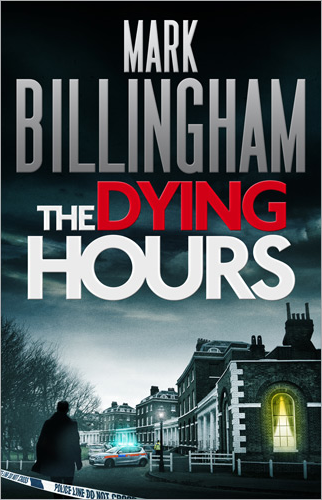 The Dying Hours had a creative storyline with an old fashioned villain type seeking vengeance. It’s a tried and test formula for a crime thriller but it was well put together and the plot was reasonably inventive with some very nice touches and a glimpse into the more humble side of Thorne’s nature. In this book DCI Thorne has to come at the crime from a different route as he doesn’t have his usual position of authority or limitless contacts to help him out, he can’t throw his weight around and has to pause and think about other ways to get results. As usual though, his dogged professionalism and desire to catch the bad guys means that he can’t give up. Personally, I didn’t enjoy the relationship with Helen (a carry on from an earlier novel), it added quite an uncomfortable element to the book but I guess it was meant to. Part of the theme through this story was highlighting the strength (or lack thereof) of Thorne’s relationships with his peers which, for me, lent an extra dimension to the crime thriller format. I greatly enjoyed this one and read it very quickly. If you are a crime thriller fan, you’ll love it I’m sure!